The Circuit Breakers, an 8th-grade team from Timberline won the state FIRST Tech Challenge and competed at regionals, along with the Waukee High School team, Gone Fishing. The FIRST Tech Challenge, a robotics competition is made up of teams of students in the grades 7-12. The teams are challenged to design, build and program their robots to compete in head-to-head challenges with an alliance team. The teams compete in five league competitions taking place between late October, November and December. At the end of the regular season, there is a league championship. Performance in this competition determines whether or not the team will advance to the regional state qualifier. If teams are successful at the state qualifier, then they advance to the state championships. This year there were 48 teams at the state championship. Out of these, 14 qualified for the super regionals. “My favorite part about being a part of The Circuit Breakers is that it is a great opportunity to meet new people, and it was fun to create the robot,” Lansing Lyon said. Gone Fishing, also known as 5340 has received many awards this season, such as the Design Award, which was won at the state qualifier and the state championship. 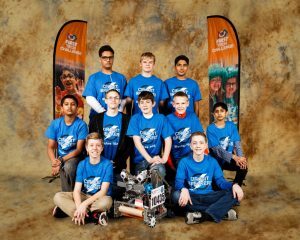 This award is given to teams that “incorporate industrial design elements into their solution,” the design of their robot has a clean look and also shows the creativity of the team. Gone Fishing has also received awards such as the Winning Alliance Award and the Design Award. The robots must complete different tasks such as pushing buttons on beacons, shooting wiffle balls into a basket and lifting a yoga ball within two and a half minutes. The robot must be able to fit into an 18 in. cube.